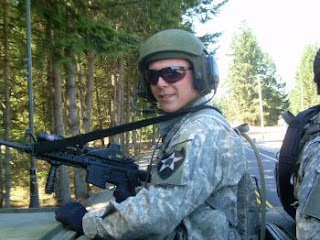 MY HERO, SPC SCOTTY GREGORY. HE'S W/A-C0. 1-38. THIS PIX WAS TAKEN @ FT. LEWIS. IT IS MY FAVORITE. SCOTTY IS OUR ONLY CHILD & IT HAS BEEN VERY QUIET @ HOME. IT AMAZES ME HOW HE & THE OTHER GUYS IN HIS PLATOON CAN BE SO POSITIVE & DETERMINED. I FEEL THAT I COULD LOVE ALL YOUR SONS.